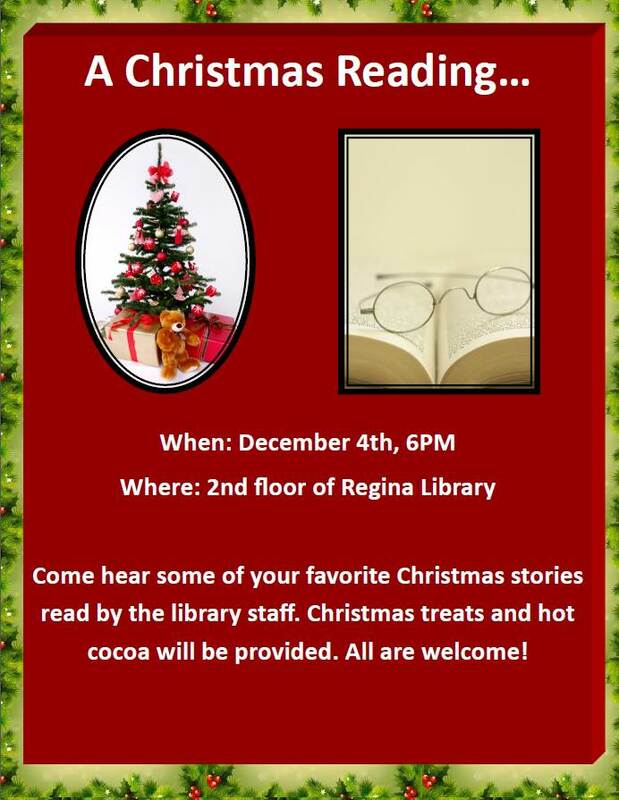 Join us for a Christmas reading! Looking for a good book to read over Thanksgiving Break? Look no further than our New Fiction display, located at the front of the library! Here you’ll find the latest in exciting and mesmerizing fiction, and if you don’t find something on the display, you can always head up to our extensive fiction section located on the third floor of the library stacks. Whether you enjoy a nice romance or a provoking science fiction novel, the Regina library has plenty to offer by way of educational and recreational reading selections. Come stop in and check out something new (or classic!) today. Have a great weekend, Raiders! Stay warm! !